This post originally appeared in National Journal. Edward Snowden has put words in President Obama's mouth. Words like transparency, reform, openness, and debate. This is not necessarily cause for celebration or condemnation. It is, however, a fact. That the White House refuses to acknowledge this is testament to the policy-altering effect of Snowden's leaks of classified documents about the National Security Agency's wide-ranging Internet and phone surveillance programs. In the East Room on Friday, Obama said he always wanted what he is now awkwardly juggling--a national debate on counterterrorism surveillance. This is demonstrably false. Obama did not want this debate, and he has been forced into numerous linguistic contortions in avoiding it. He did not want a debate that forced him to embrace a review panel to examine his administration's countersurveillance practices and to call for a privacy and civil-liberties advocate before the secret Foreign Intelligence Surveillance Court that approves surveillance warrants. On Friday, Obama sought to limit the ferocity of the debate by asserting his role as calm, constitutional arbiter of executive power and reform. "I believe that there are steps we can take to give the American people additional confidence that there are additional safeguards against abuse," he said. Obama authorized more surveillance than President George W. Bush in part because technology and threat matrices convinced him it was necessary. For two months since Snowden's leaks, Obama has been hesitant to engage in debate and call for reforms, in part because he was waiting for the Justice Department and intelligence community to cough up information explaining what the NSA was doing and its legal authority. Obama released much of that on Friday. It was a defensive move designed to prove he hasn't abused powers and that the surveillance has defined and defensible limits. That assertion was undercut by additional--there is that word again--reporting about the NSA's previously unknown authority to cull data about Americans in the general neighborhood, electronically speaking, of suspected terrorist communications. All of this has raised, despite Obama's reassurances, concern about the real-time hollowing out of Fourth Amendment protections. "In the years to come, we will have to keep working hard to strike the appropriate balance between our need for security and preserving those freedoms that make us who we are. That means reviewing the authorities of law enforcement, so we can intercept new types of communication, but also build in privacy protections to prevent abuse." The key phrases here: "years to come"; "intercept new types of communication"; and "privacy protections to prevent abuse." Obama fully embraced the status quo in counterterrorism surveillance, meaning all the programs Snowden was about to disclose, and called for a debate in some distant future about more authorities to intercept "new types" of communication outside of telephone and Internet data. Any fair reading of this surveillance-speech widget shows that it pointed to expanding the legal regime under which existing--but unknown--surveillance was already taking place. The throwaway line "also build in privacy protections to prevent abuse" equates the potential for wrongdoing only with new government powers more broad than currently exist, asserting no abuses have or will occur under existing surveillance schemes. This is not kicking off a debate on domestic surveillance. It is kicking the can down the road of more surveillance that adapts to growing governmental capabilities to gather, sift, and analyze data in counterterrorism operations. Obama's own words in the National Defense University speech reveal perfectly his pre-Snowden mindset on counterterrorism surveillance machinery. It is vast. It works. It grows as the volume of data grows. I need it and will need to expand it. That truth is also found in Obama's history of antagonism toward congressional curiosity about the surveillance programs and in legal briefs in defense of data collection that were already being challenged before Snowden's revelations. Obama is not the first president seduced by the vast martial powers of commander in chief, and he won't be the last. There is nothing condemnable in the application of presidential power to meet a perceived or known threat, especially when, as with computer-surveillance operations, the techniques and technologies advance rapidly and the depth and breadth of searchable data expands exponentially. It is not naïve to assert that the counterterrorism-surveillance treadmill spins at maximum speed and no president, not even a self-avowed surveillance skeptic like Obama, can keep pace. Snowden's classified leaks sought to knock Obama off the treadmill and, if possible, slow the data collection down. He leaked classified documents and must face the legal consequences. Words like patriot, traitor, and defector are now bandied about to define Snowden. A court of law will decide if he's a criminal. Individual Americans, as they always have, will determine if he's a patriot. Obama: Snowden is no "patriot"
NSA surveillance: Is there adequate oversight? Those closest to Obama say he feels burned by Snowden's leaks because Obama has convinced himself he added civil-liberties protections as he authorized more-aggressive surveillance data collection. Obama is irked that Snowden didn't use the president's own executive order giving a whistle-blower power to petition authorities. Obama's central conceit, challenged by Snowden, was that he had improved surveillance, added privacy protections, and kept the country safe. What president wouldn't want to protect that legacy and enlarge it on his terms? Snowden's leaks have forced Obama to defend his programs in the clamorous public square, where politics runs rampant, opponents strike poses, and where "complex" details can be confused, misinterpreted, or ignored. Obama did not seek this debate. He does not particularly enjoy this debate. He's groping for words to protect a surveillance regime many in his political base find repugnant and that is under increasing legal assault. The debate is very much alive and Obama is a reluctant participant. He's trying to outmaneuver critics who find more traction with each new disclosure. The president is trying to get ahead of that process by calling for transparency and having a review board offer recommendations while Snowden's new leaks are likely to keep surfacing. Obama is now in a campaign to protect a surveillance architecture he believes works--even if it raises alarms among civil libertarians on the right and left. He will have to explain his rationale for the surveillance super-state that now exists. Republicans want Obama to defend the programs more vigorously. Many Democrats want him to dramatically curtail surveillance. The president, for now, is hoping to buy time with soothing non sequiturs about "additional confidence" and "additional safeguards." The debate is here to stay. 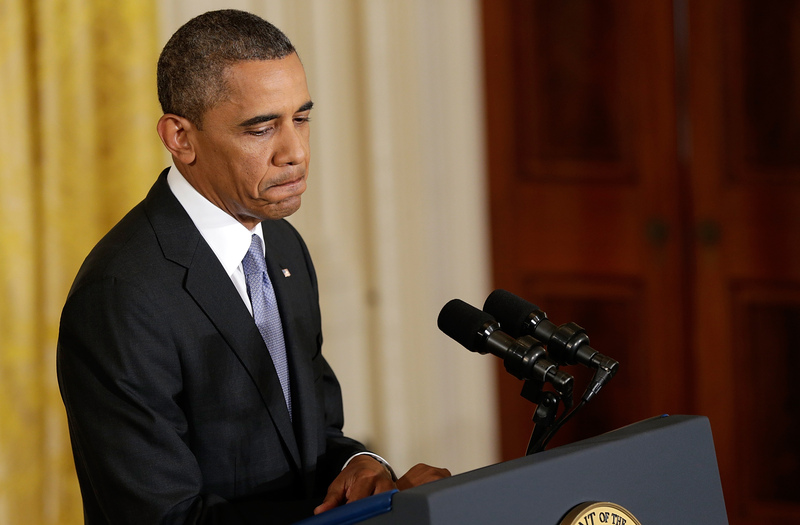 Obama is now the central figure that he, possibly for the first time ever, never wanted to be. Snowden's leaks shoved Obama on the surveillance center stage. Act One is over. Obama's looking for better writers during intermission, before Act Two.